enough flour so the dough isn't overly sticky, but not too stiff). Stir in raisins. 2. Knead on a floured surface for 6-8 minutes. Place in a greased bowl, turning to coat top and cover with plastic wrap. Let rise for about an hour or until doubled. 3. Punch down dough. Divide dough in half and roll each half into a 18 by 9 inch rectangle. Combine sugar and cinnamon, reserving 2 tablespoons for topping, Sprinkle mixture over each rectangle to within a half inch of the edge. Roll up rectangles starting from the short side and pinch seams to seal. 4. Place loafs into two greased loaf pans. Cover with plastic wrap and let rise 30 minutes or until doubled in size. Sprinkle with remaining cinnamon sugar mixture. 5. Bake for 35-40 minutes at 375 degrees. If tops begin to overly brown, place a tent foil over top. Makes two loafs. This recipe is very easy and I has consistent results. It is delicious with butter or makes great cinnamon toast. My whole family has fallen in love with this bread and I make it about once every two weeks. A great, simple bread recipe. Note: I use bread flour for my bread baking, but all-purpose flour works fine also. I added to the recipe that additional flour can be added if the dough is too sticky to handle and realized when I made this bread last night that I normally use 4 1/2 teaspoons of yeast, not 5 teaspoons. The recipe is now exactly as I bake it. I adapted this recipe from page 543 of The Taste of Home Cookbook 2009 edition. @J.Lynn Thanks :) Going now to follow you back! @Sarah Thanks :) It tastes pretty yummy! not much prettier in the world and NOTHING makes your kitchen smell better than that baking loaf! my popa was a baker so it's in my genes; can't wait to try this recipe, my husband loves this type of bread, thanks! 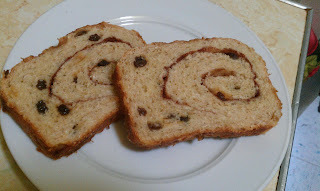 Cinnamon Raisin Bread is a weakness of mine! I will definitely be trying this. Stopping by to say hello from the Whimsical Wednesday hop. @cricketsets Cinnamon raisin bread is one of my favorites as well :) Going over to follow you back now! Thanks for the recipe! Fresh baked bread is wonderful - and with cinnamon...Heaven! I love cinnamon swirl bread, but would have never considered baking it myself. But I think we might make a grocery run today and give this a shot. Your bread is beautiful! This would be great as french toast too, thanks. @Michelle It's really easy to make and doesn't take a lot of ingredients! @Melynda Thanks :) My boys love when I make french toast with this bread! @Philippa Thanks :) I cook a lot of bread in the fall and winter, it's a great comfort food in the cooler weather! ohh this is great. I was just looking for bread recipes on the net. But since it would be my first time, I wanted 'tested' recipes. :) Thanks for this! Exactly what I needed this weekend. @rochie I hope your bread turned out well, fresh bread is the best :) It makes great french toast if you have extra!